Can you see a theme with me? I am on a shrimp rampage. But I am not too concerned because when it comes to my diet, everything is a phase. But let me tell you; this garlic lemon shrimp and avocado toast recipe may have a longer phase with me than usual. It is just so delicious and easy to make. This shrimp and avocado toast recipe can be enjoyed as an appetizer, lunch or dinner recipe. I only omit breakfast because I just cannot image eating shrimp for breakfast. But hey, if you don’t mind eating shrimp for breakfast go for it. Who am I to judge right? This recipe gives a one two punch on both the garlic and the lemon. This is done by adding minced garlic to the shrimp before cooking and by using minced garlic butter to butter your bread of choice. Alternatively, on a lazy day you can just put some garlic flavored Texas toast in the oven while you cook the shrimp. Once the shrimp has cooked they are tossed lightly in fresh lemon juice and additional lemon juice is added to the avocado mix. When all ingredients have been combined on your plate and you take you first bite, be ready for that one two punch of pure delight. The combination of flavors that hit your palate is fantastic. Preheat oven to a high broil. Light butter your bread with the garlic butter and place on a parchment lined baking sheet. Broil until a nice golden color. Remove from oven and set aside. While the bread is broiling, prepare your shrimp. Add the shrimp, garlic and lemon juice to a bowl. Season with a little salt and pepper. Add the EVOO to a skillet and heat until shimmering. Add the shrimp and cook about 2 to 3 minutes per side. Be careful not to over cook your shrimp. You want them cooked through and no longer opaque in color. Remove from heat and sprinkle on the parsley. In a large bowl combine all of the avocado salad ingredients. Mix well to combine. Gently fold in the shrimp. 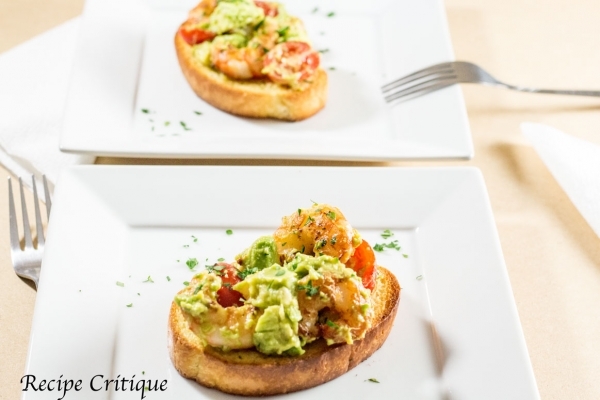 Spoon equal amounts of the shrimp avocado mix on to each slice of toast and serve warm. This is a delicious, deceptively easy dish to put together. 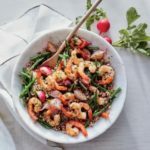 If you are making these as appetizers and are serving them room temperature, the shrimp can be prepared in advance. Simply refrigerate until you are ready to use. Although I prefer to make mine just before serving, you can choose to make your avocado mix in advance too, just be sure to add the lemon juice immediately to stop the avocado from browning. I do not recommend making the toast in advance. Make the toast immediately before serving to insure you get that warm, juicy, melted garlic butter taste that we all know and love.